Three styles of regrind fixtures are available from Sterling. DM-41 and DM-42: A regrind fixture for tool and cutter grinding machines for drills from 4 to 54mm. 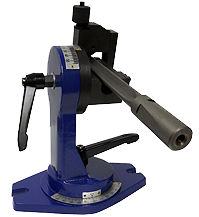 DM-43: A machine complete with the toolholder and diamond wheel for drills from 2.5 to 18mm. Either style of regrinding fixture can be used to re-sharpen gun drills and half round drills, or, use Sterling Gun Drills’ re-sharpening service with fast turnaround. 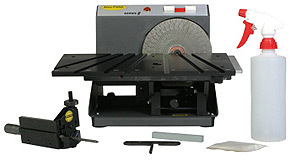 This machine comes complete with the toolholder and diamond grinding wheel. A regrind fixture for tool and cutter grinding machines. Either style of regrinding fixture can be used to resharpen half round and/or single flute drills, or take advantage of Sterling Gun Drills' resharpening service with fast turnaround. Please also view the Regrinding Section.